Robin Hunicke, director of art and design in the Games and Playable Media program at UC Santa Cruz, showcased her innovative work at a gathering of TEDWomen Experience participants last week. Hunicke was among a handful of presenting UC female entrepreneurs whose startups have a common goal—to make the world a better place. The startups ranged from a gaming company that uses virtual reality to help people overcome trauma, to an exoskeleton that lets people with disabilities transcend their wheelchairs. “These women are part of a great and inspiring community of innovators and entrepreneurs from UC,” said Christine Gulbranson, UC’s senior vice president for research innovation and entrepreneurship, who hosted the event. “Their research and resultant products demonstrate the incredible positive impact UC entrepreneurs are making in the world." 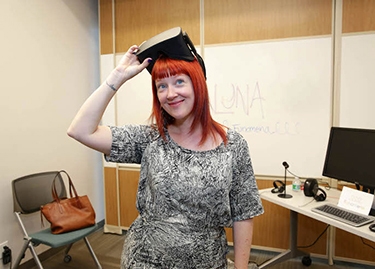 Hunicke, the CEO and cofounder of San Francisco-based indie game studio Funomena, showcased Luna, a virtual reality experience that was inspired by a dream. A prominent advocate of the Intentional Play movement--aimed at inspiring developers to create games that have a larger purpose beyond just entertainment--Hunicke has been creating games for more than a decade.